Definition at line 41 of file util-var-name.c. Definition at line 45 of file util-var-name.c. 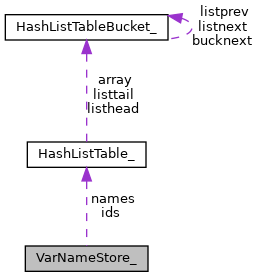 Referenced by VarNameStoreFree(), and VarNameStoreSetupStaging(). Definition at line 43 of file util-var-name.c. Referenced by VarNameStoreLookupById(), and VarNameStoreSetupStaging(). Definition at line 44 of file util-var-name.c. Definition at line 42 of file util-var-name.c. Referenced by VarNameStoreLookupByName(), and VarNameStoreSetupStaging().